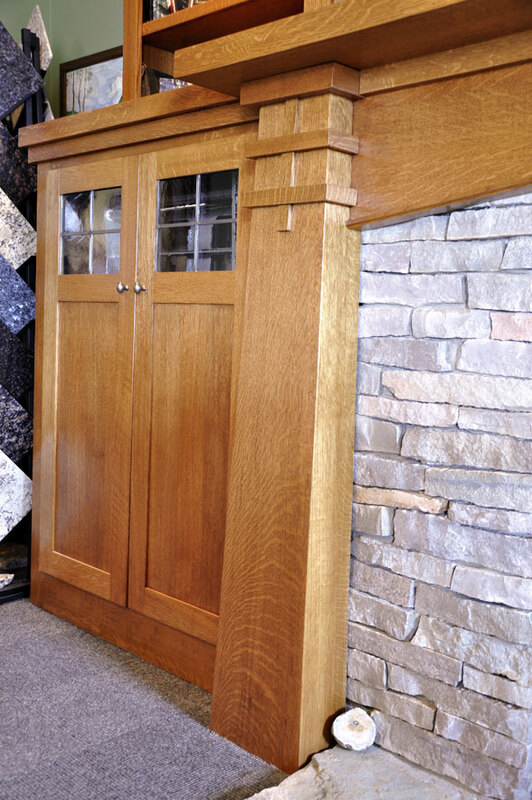 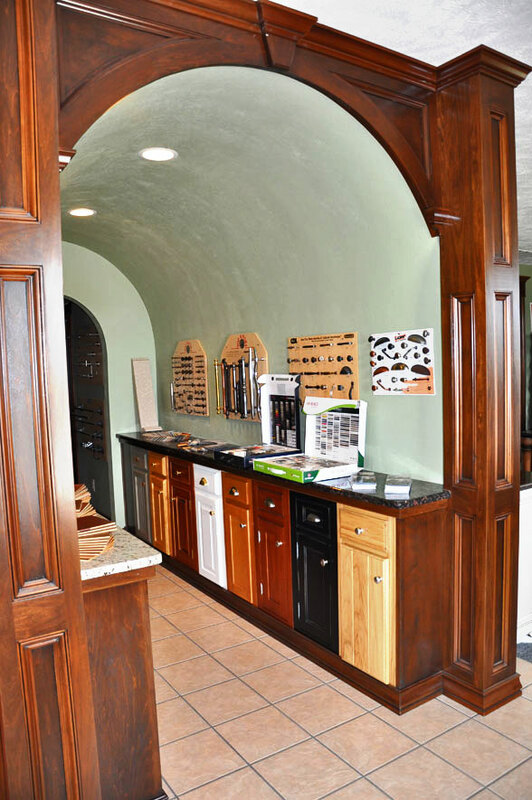 We are very proud to display our custom designed cabinets in our showroom. 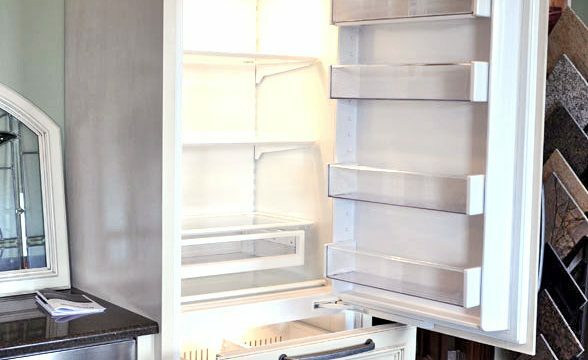 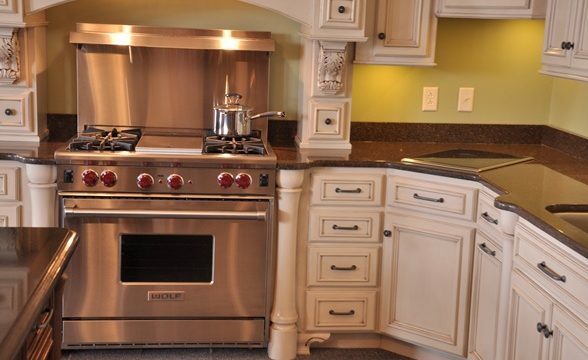 Featured along side our custom cabinets is a very large selection of appliances including SubZero refrigerators, ice makers and under counter wine storage along with Wolf gas ranges, induction cooktops, steamers and built-in microwaves. 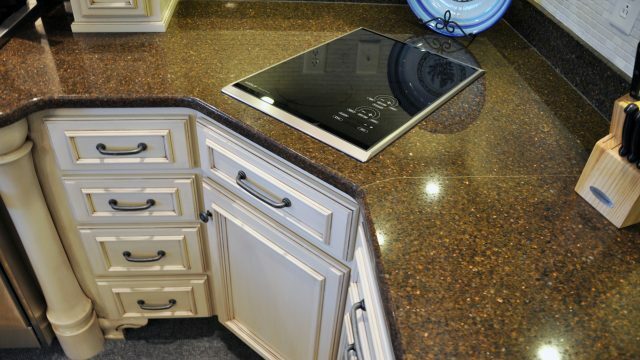 We also showcase a large selection of granite and quartz countertops and samples and LG HI~MACS solid surface and WilsonArt and Formica laminate tops as well. 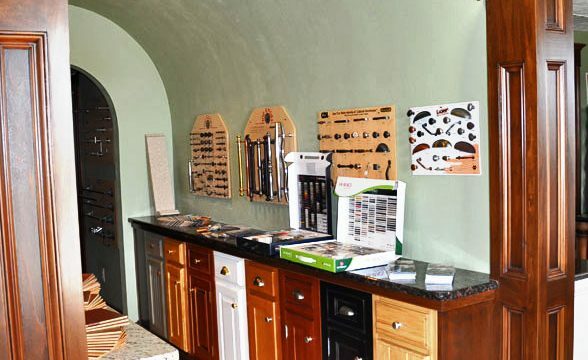 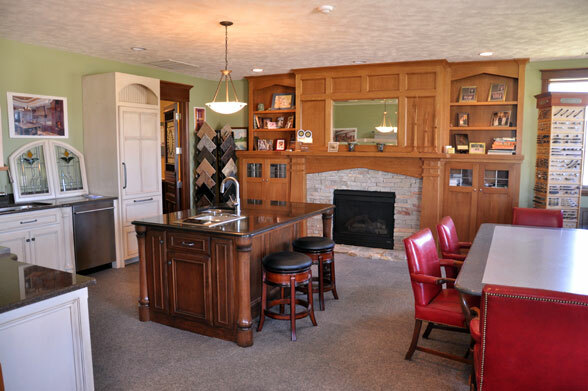 Please stop by our showroom in Wapella, Illinois for a visit. 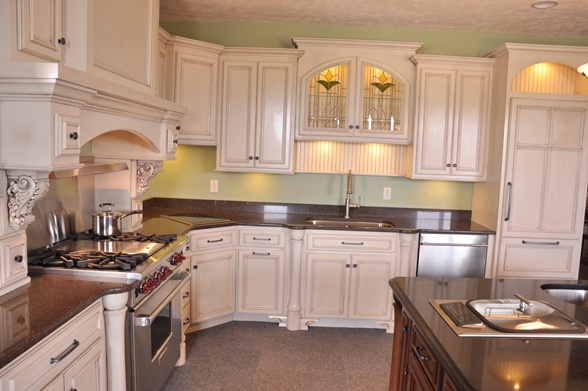 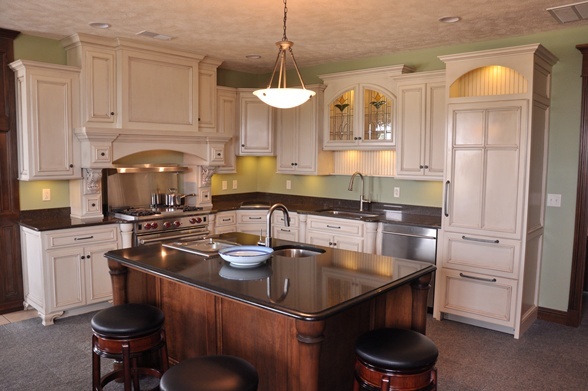 Maple kitchen cabinets painted with glaze and and contrasting custom island. 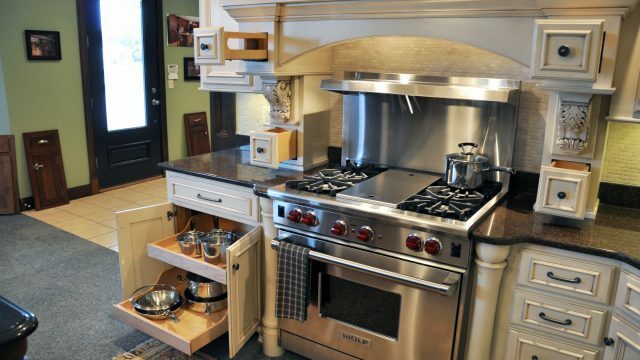 Wolf 36″ range, Wolf built-in steamer, Wolf induction cooktop, SubZero 700 series refrigeration, large one tub sink and faucet, granite countertops, quartz countertops, custom art glass and under counter lights. 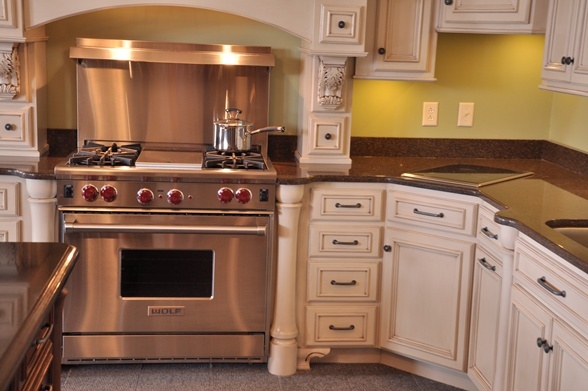 Custom hearth hood with Best exhaust and Wolf 36″ all gas range. 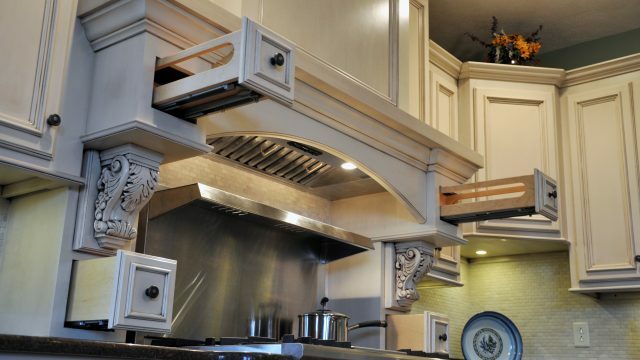 Custom Hearth Hood and Cabinets feature pull out shelves, pull out garbage, tip out trays, silverware dividers, cookie sheet storage racks and spice drawers. 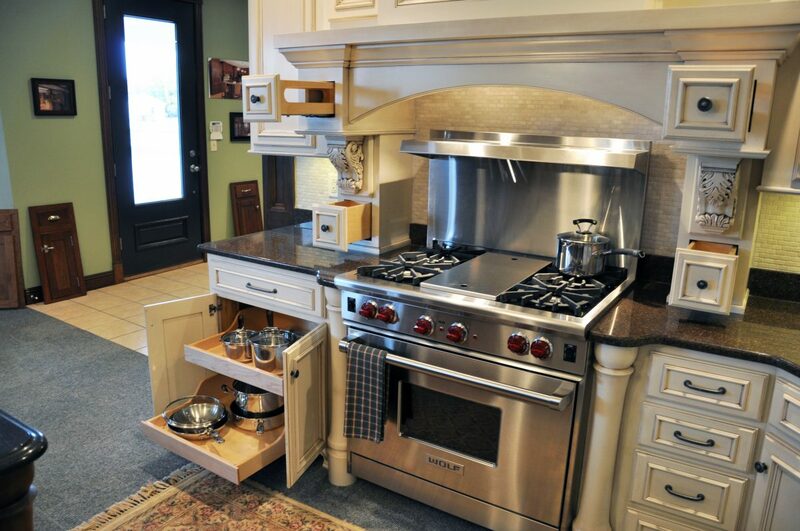 Custom Hearth Hood with Best exhaust and custom spice drawers. 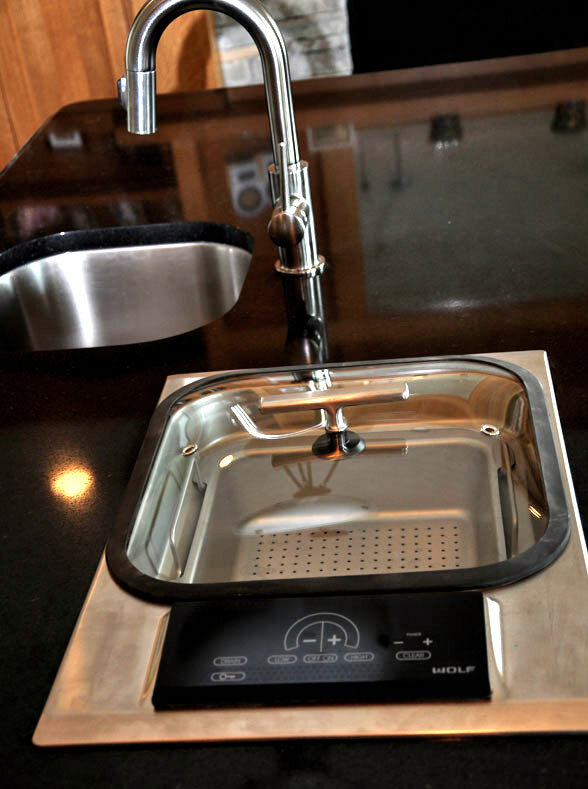 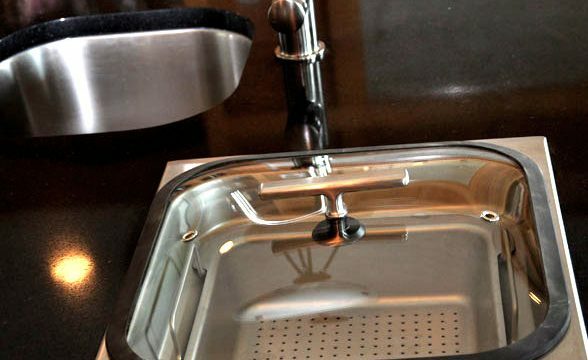 Viantera Quartz countertops include built-in induction cooktop. 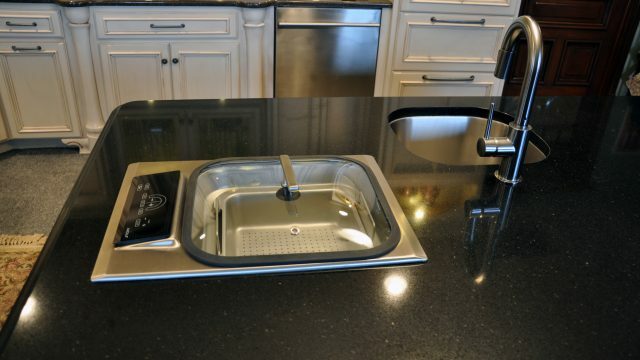 Granite Island with built-in sink and Wolf Steamer. 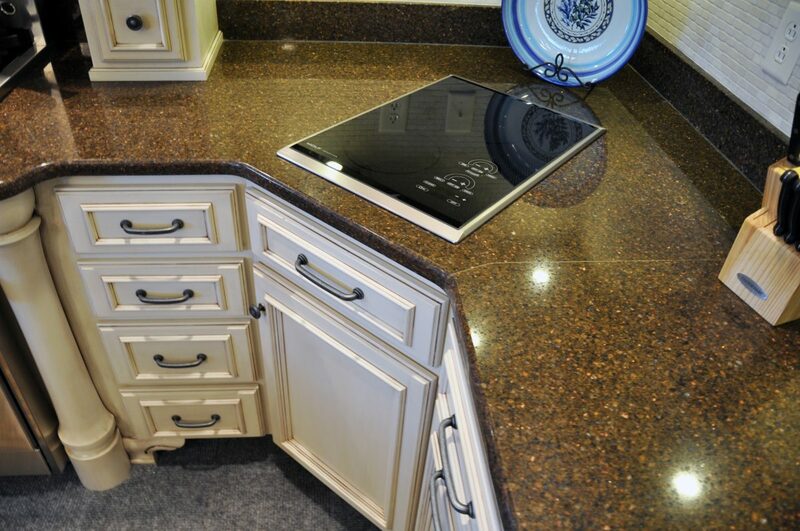 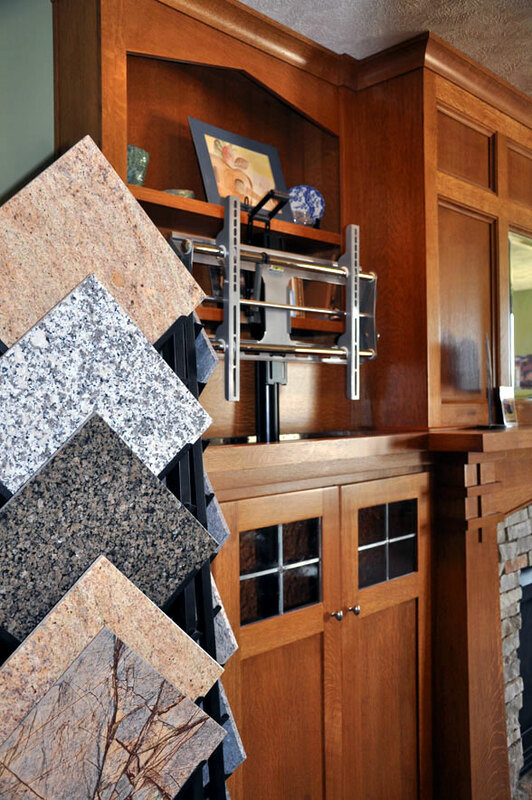 Randall Cabinets has a full line of granite counter tops for kitchens, baths, and fire places. 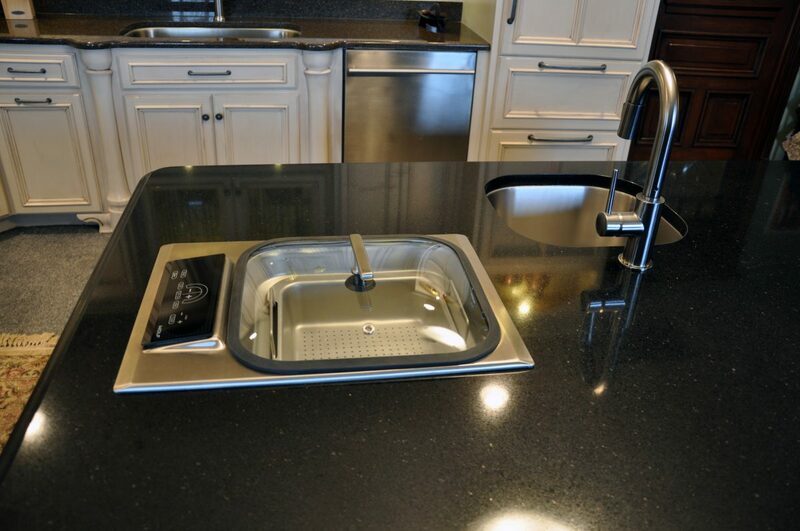 Wolf built-in steamer in Black Galaxy granite countertops. 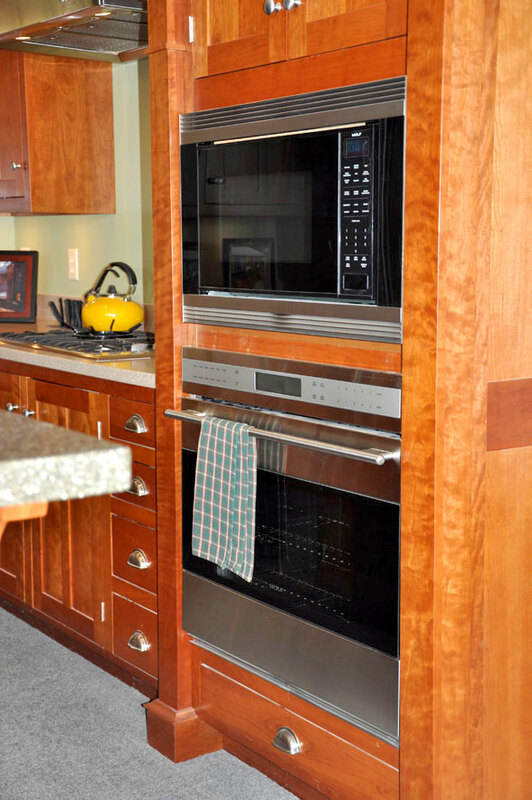 Built in Sub Zero 700 Series complements the maple kitchen cabinets. 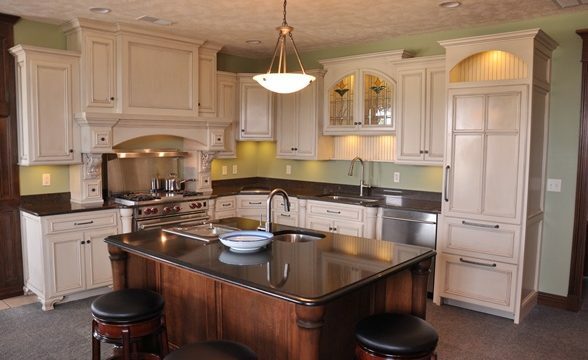 Custom island built to contrast with kitchen cabinets. 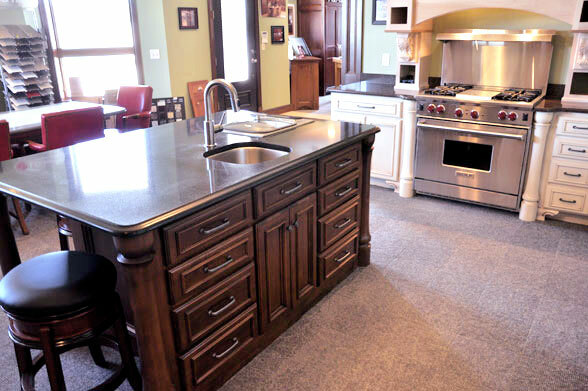 Using granite countertop, island prep sink and island faucet, Wolf steamer and fine hand-crafted columns. 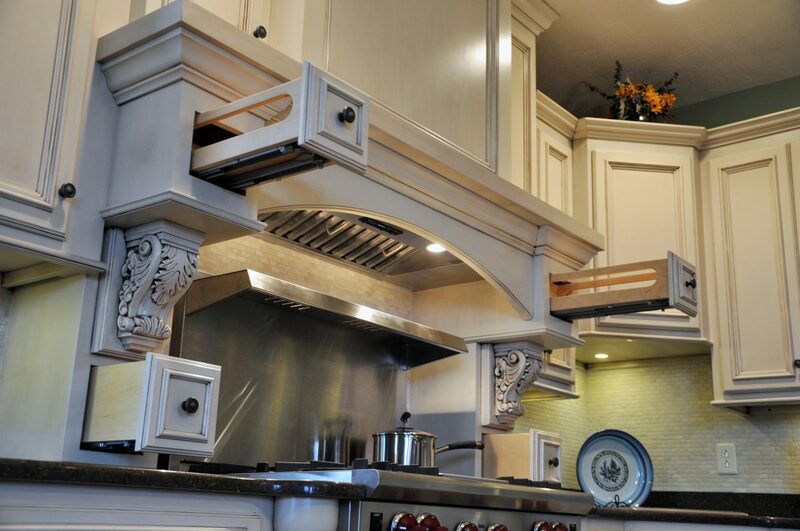 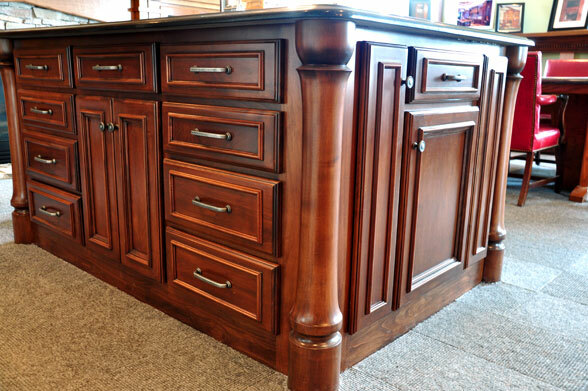 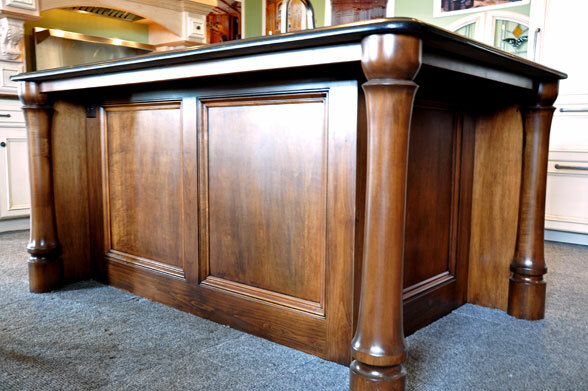 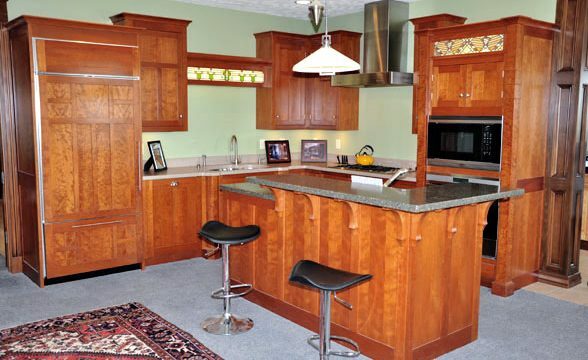 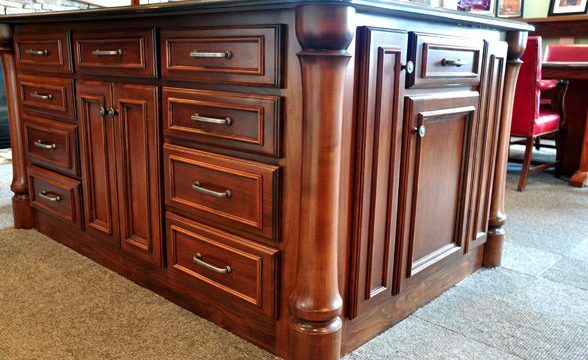 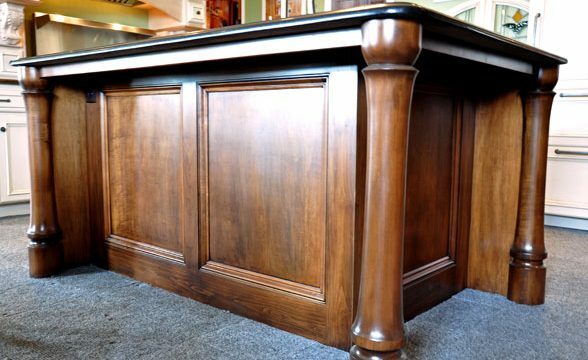 This custom island highlights the fine woodworking that Randall Cabinets has to offer. 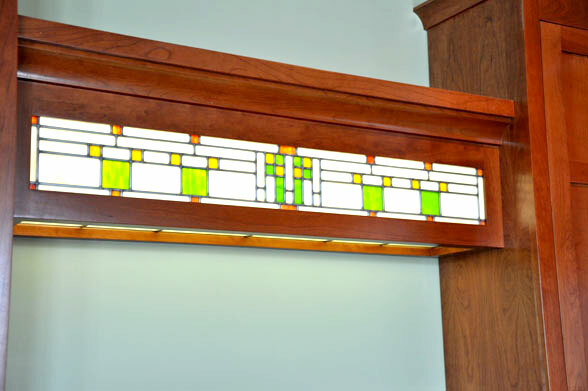 Built in custom art glass always adds a nice touch to any room. 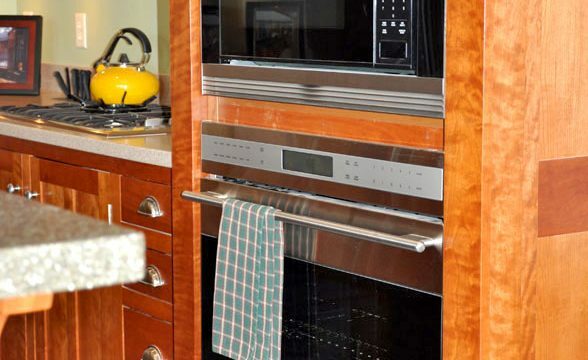 This luxury kitchen includes built-in Wolf Microwave and electric wall oven, Fisher Paykel cooktop and exhaust, Sub Zero ice maker and refrigerator in cherry kitchen cabinets with custom decorative end panels and corbels. 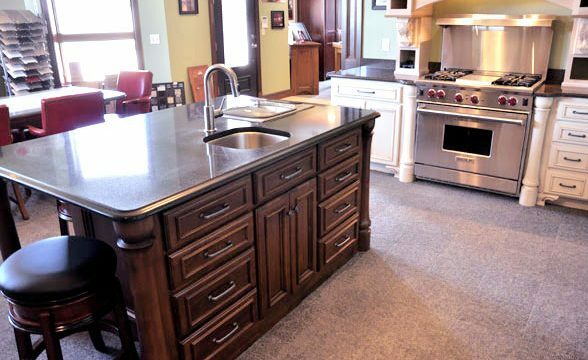 Island with prep sink and faucet showcase LG HI~MACS countertops. 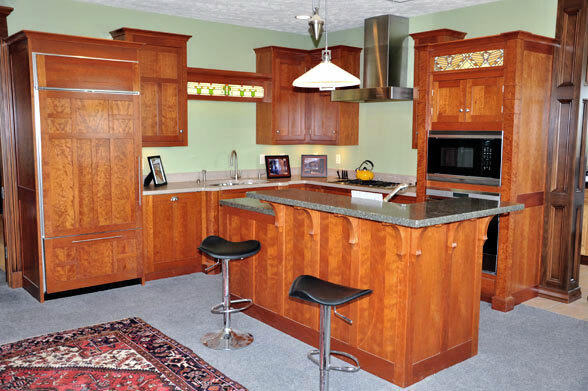 Built in Wolf Microwave and electric wall oven in cherry cabinets with custom decorative end panels add modern style. 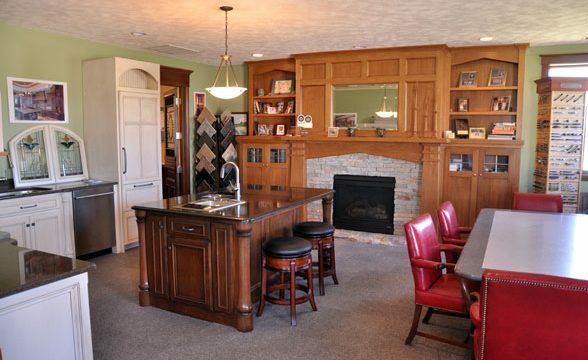 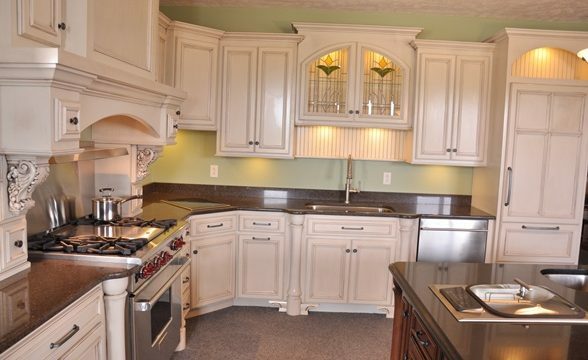 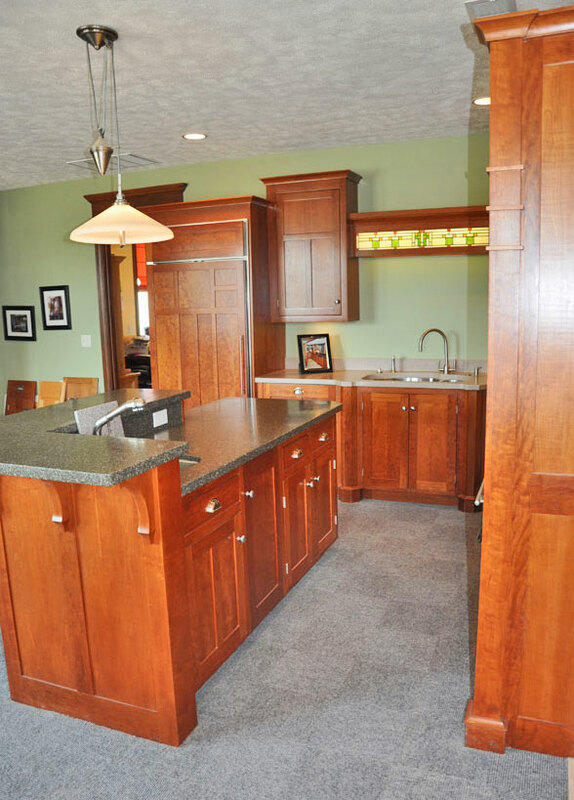 Built in Sub Zero ice maker and refrigerator in cherry kitchen cabinets with custom decorative end panels and corbels. 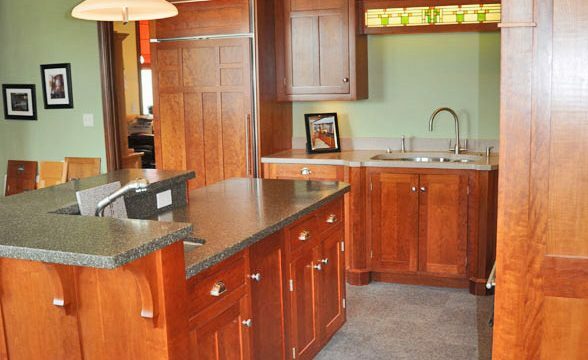 LG HI~MACS countertop with island prep sink and faucet. 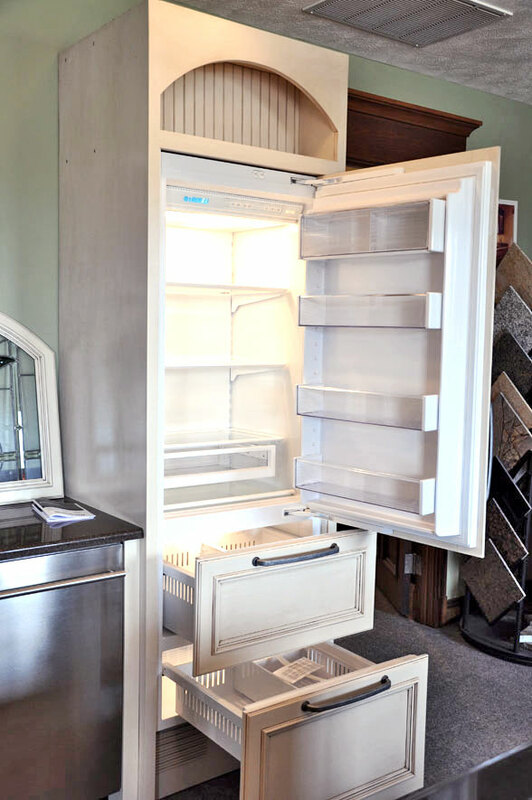 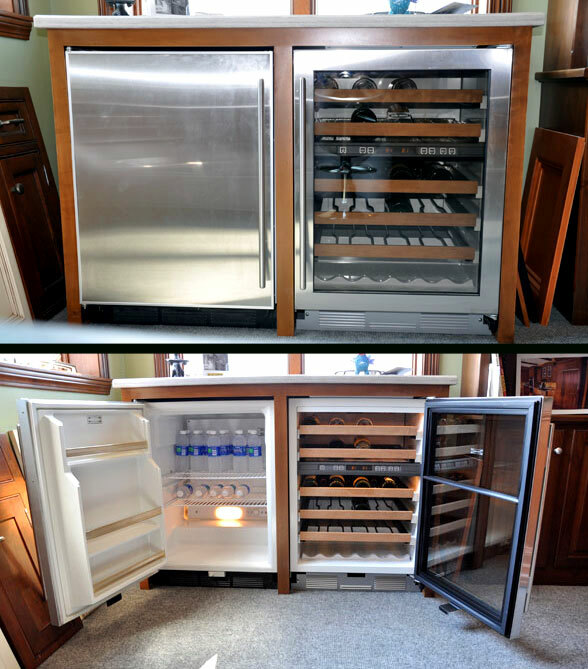 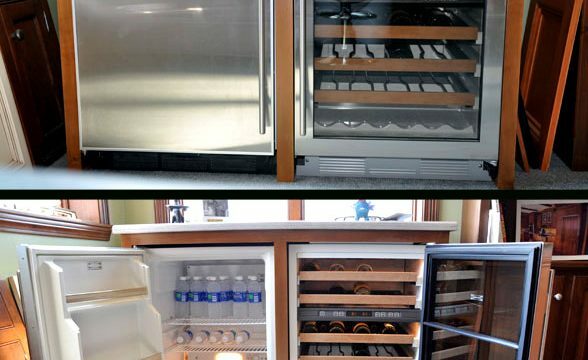 Built in Sub Zero 24″ under counter all refrigerator and 24″ wine storage cooler. 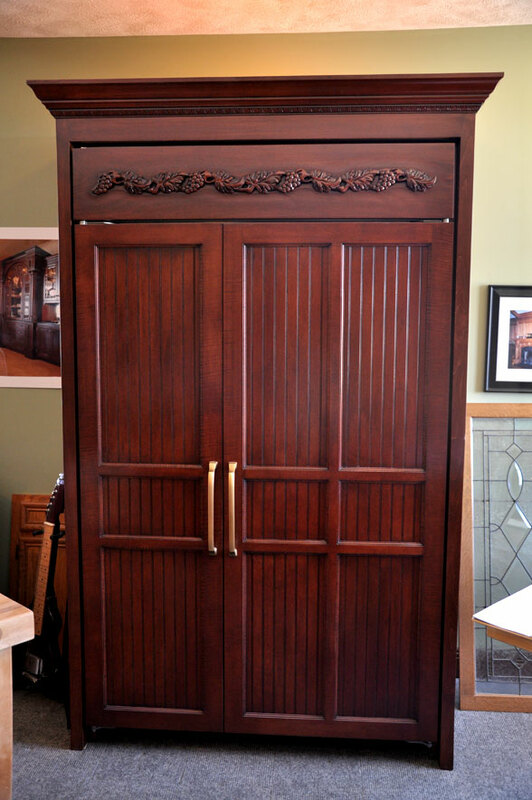 Built in Sub Zero Armoire. 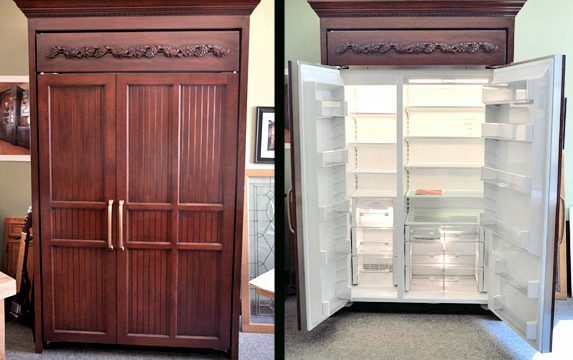 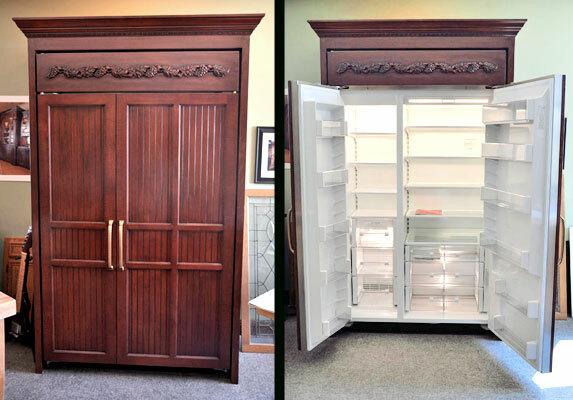 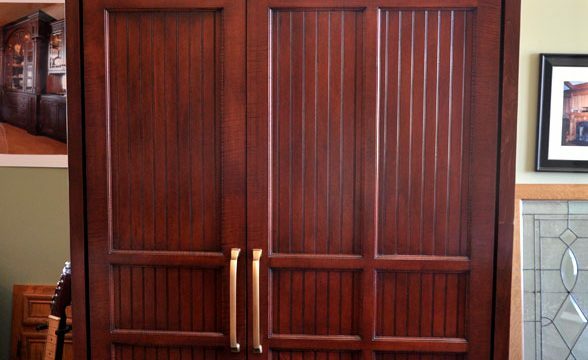 Custom armoire style cabinet built for Sub Zero BI refrigerator. 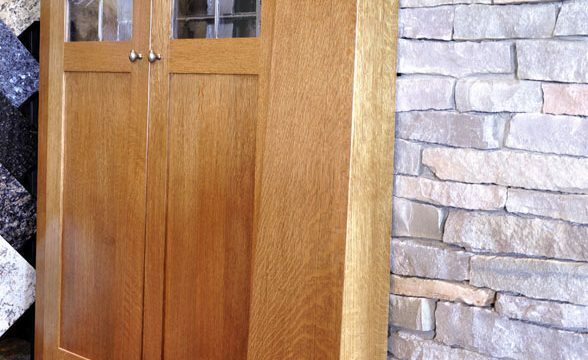 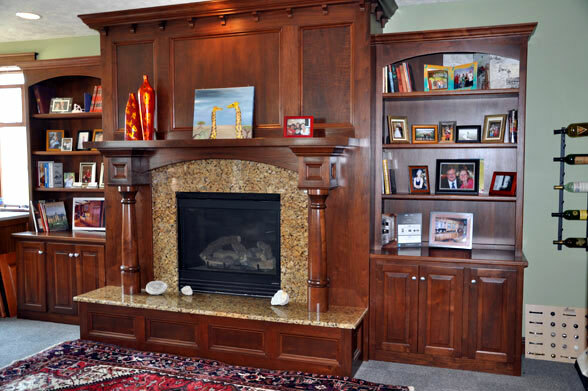 Mission style quartersawn white oak cabinets, panel scheme with mirror and fireplace surround using KV flat panel television lift. 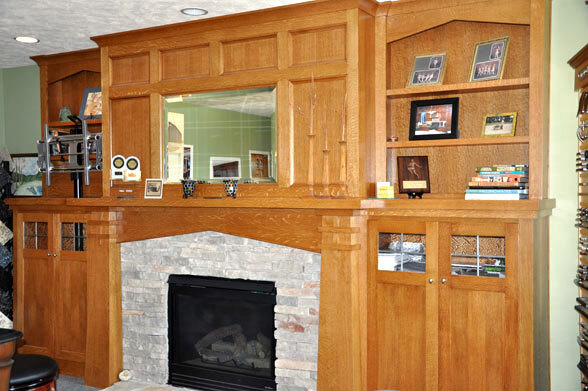 Custom brick detail highlights the Heat-&-Glo fireplace. 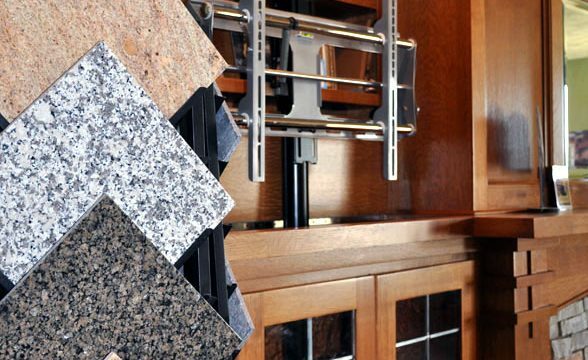 TV lift mechanism and granite samples. 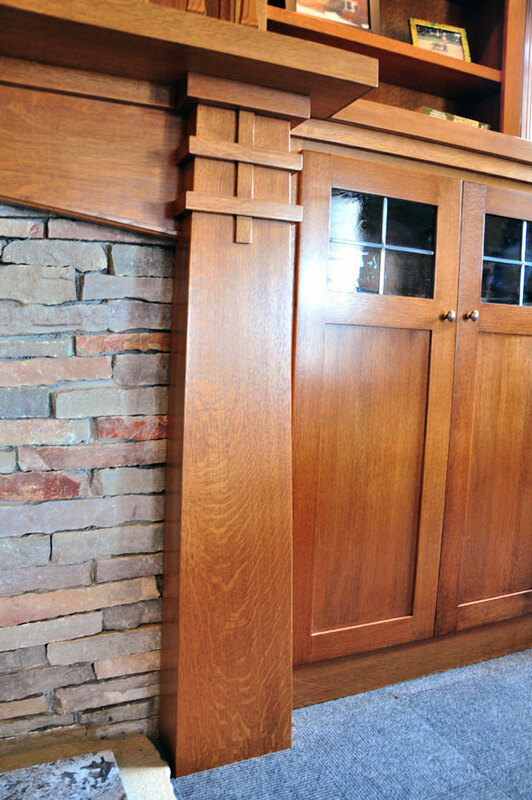 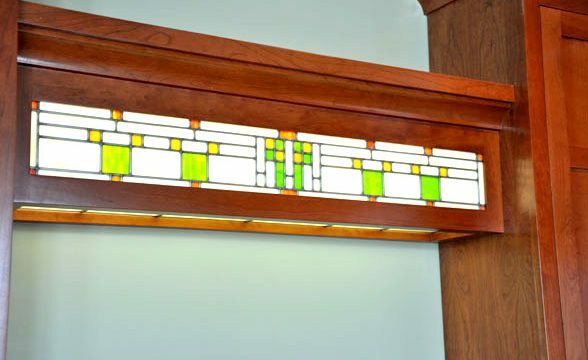 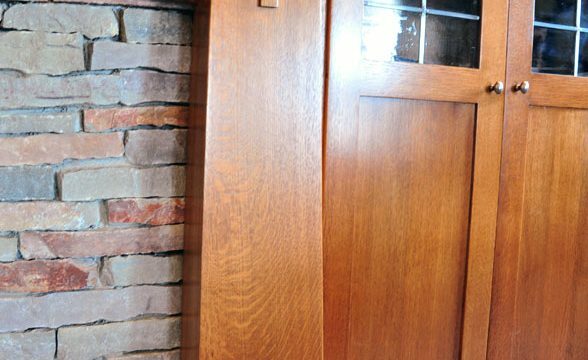 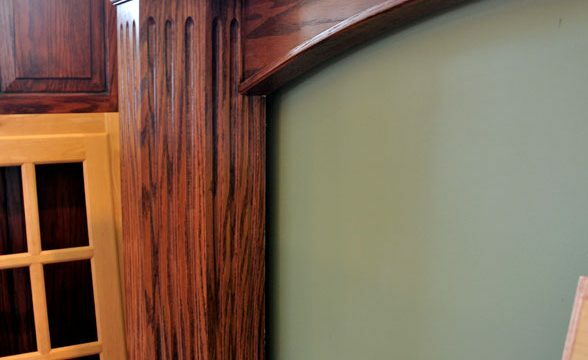 Details of Prairie style fireplace surround with molding and tapered columns, leaded art glass panel inserts, KV flat panel television lift. 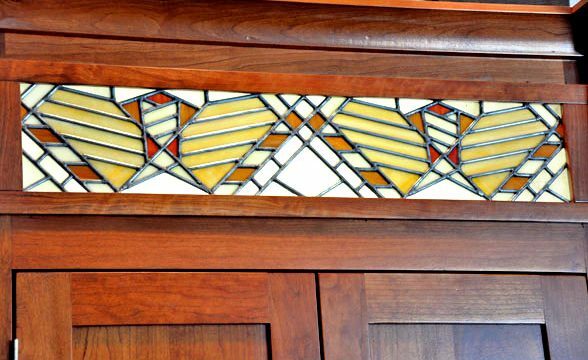 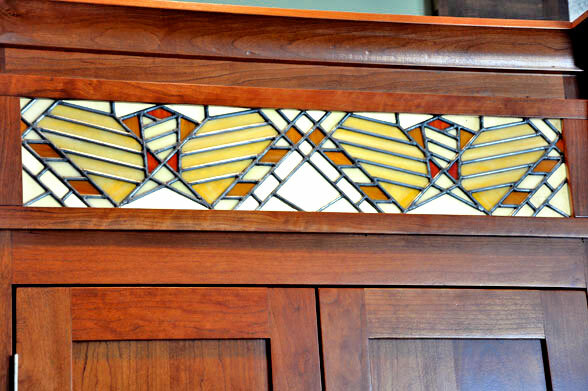 Details of Prairie style fireplace surround with molding and tapered columns and art glass panel inserts. 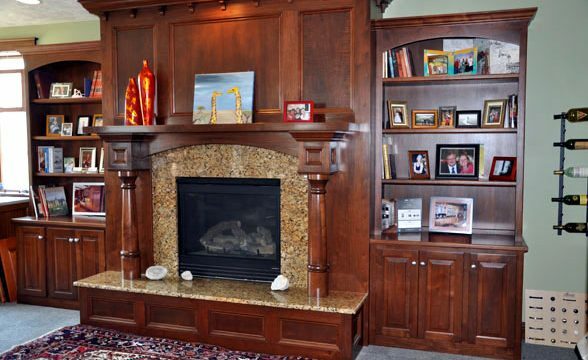 Walnut fireplace surround, mantel, panel scheme, turned columns and arch header, bookcase units with adjustable shelves. 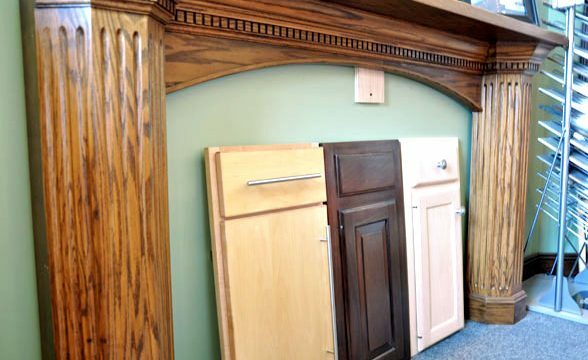 Support columns with arch entry way header leads to barrel ceiling with cabinet for door and granite samples. 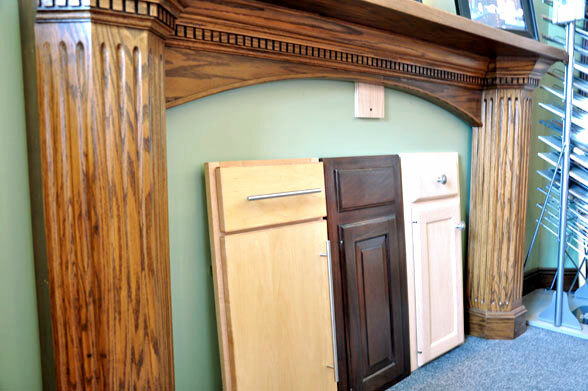 Details of arch fireplace surround with Dentil molding and fluted columns. 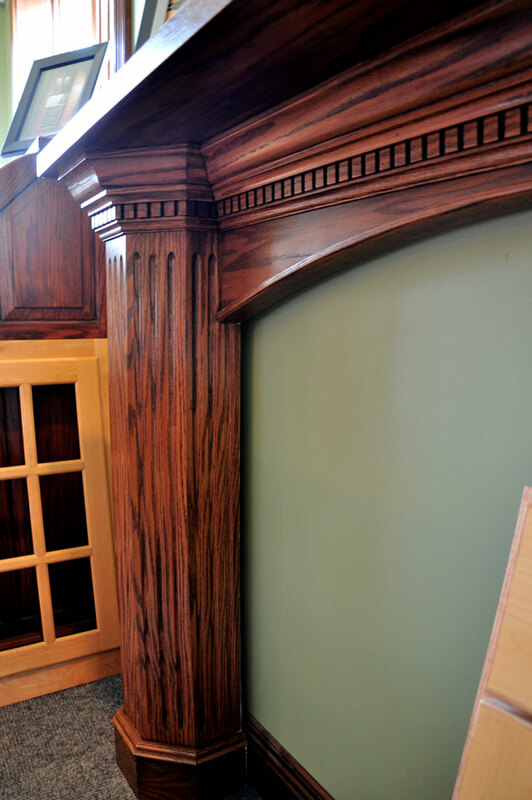 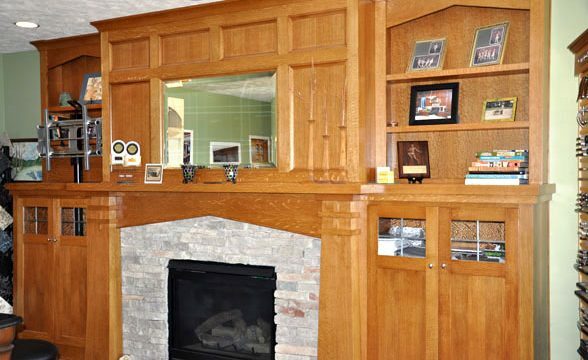 Details of custom fireplace mantel with flutes and Dentil molding.